Cook the spelt according the instructions on the packet. Boil the eggs for 7 minutes, let them cool slightly and peel. Cut in four. Heat the sunflower oil in a deep frying pan and add the onions, kale and cayenne powder. Fry for around 4 minutes before adding the defrosted broad beans. Fry for another 4 minutes or so. Mix in the carrot, the spelt and lemon juice. Cut the vegetarian bacon in strips and fry until slightly crisp. 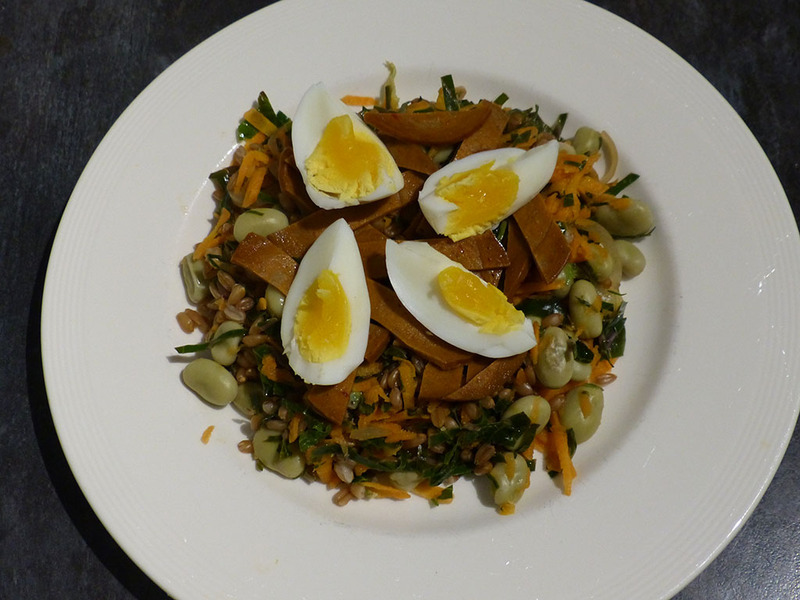 Divide the spelt salad over 4 plates and top with the fried vegetarian bacon strips and boiled egg parts.